Who says that building toys are not for girls has clearly not seen the Blossom series of Clicformers! What do you think of this Blossom 100 pcs box full of building blocks in fresh pastel colors? Admit it, seeing the package alone will give your child the urge to start building right away! 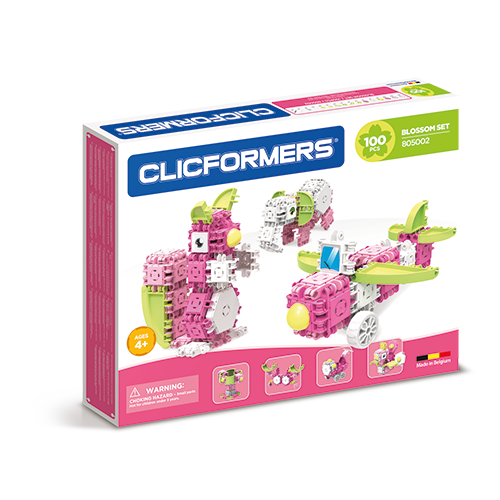 And then you haven’t told her what you can build with this Blossom 100 pcs from Clicformers. In addition to the fact that you can let your own inspiration run free, you are also helped by the booklet full of building plans that is included in the package. In need of more inspiration? Download more building plans online! Curious to know what you can build with this Blossom 100 pcs package? How about an elephant with a funny trunk or a proud peacock? Do you prefer smaller animals? That’s possible too! The squirrel and the crab will immediately be your favorites! To reward yourself, you can also build a trophy, for example after you have successfully built the plane, the baby stroller or the camper! 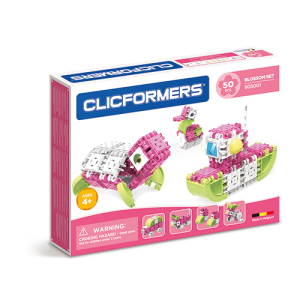 You will certainly have earned that trophy, especially if you know that the STEM toys from Clicformers will make you even smarter!